An injectable tissue engineering scaffold composed of poly(N-isopropylacrylamide)-graft-chondroitin sulfate (PNIPAAm-g-CS)-containing alginate microparticles was prepared. The adhesive strength, swelling properties and in vitro biocompatibility are analyzed in this study. The characterization techniques developed here may be applicable to other thermogelling systems. Christiani, T. R., Toomer, K., Sheehan, J., Nitzl, A., Branda, A., England, E., Graney, P., Iftode, C., Vernengo, A. J. Synthesis of Thermogelling Poly(N-isopropylacrylamide)-graft-chondroitin Sulfate Composites with Alginate Microparticles for Tissue Engineering. J. Vis. Exp. (116), e53704, doi:10.3791/53704 (2016). Injectable biomaterials are defined as implantable materials that can be introduced into the body as a liquid and solidify in situ. Such materials offer the clinical advantages of being implanted minimally invasively and easily forming space-filling solids in irregularly shaped defects. Injectable biomaterials have been widely investigated as scaffolds for tissue engineering. However, for the repair of certain load-bearing areas in the body, such as the intervertebral disc, scaffolds should possess adhesive properties. This will minimize the risk of dislocation during motion and ensure intimate contact with the surrounding tissue, providing adequate transmission of forces. Here, we describe the preparation and characterization of a scaffold composed of thermally sensitive poly(N-isopropylacrylamide)-graft-chondroitin sulfate (PNIPAAM-g-CS) and alginate microparticles. The PNIPAAm-g-CS copolymer forms a viscous solution in water at RT, into which alginate particles are suspended to enhance adhesion. Above the lower critical solution temperature (LCST), around 30 °C, the copolymer forms a solid gel around the microparticles. We have adapted standard biomaterials characterization procedures to take into account the reversible phase transition of PNIPAAm-g-CS. Results indicate that the incorporation of 50 or 75 mg/ml alginate particles into 5% (w/v) PNIPAAm-g-CS solutions quadruple the adhesive tensile strength of PNIPAAm-gCS alone (p<0.05). The incorporation of alginate microparticles also significantly increases swelling capacity of PNIPAAm-g-CS (p<0.05), helping to maintain a space-filling gel within tissue defects. Finally, results of the in vitro toxicology assay kit, 2,3-bis-(2-methoxy-4-nitro-5-sulfophenyl)-2H-tetrazolium-5-carboxanilide (XTT) and Live/Dead viability assay indicate that the adhesive is capable of supporting the survival and proliferation of encapsulated Human Embryonic Kidney (HEK) 293 cells over 5 days. Injectable biomaterials are those that can be conveniently delivered into the body as a liquid and solidify in situ. Such materials have been applied extensively in regenerative medicine, where they are used to deliver encapsulated cells to the affected site 1-4 and act as a three-dimensional temporary extracellular matrix for the cells 5. For the patient, injectable biomaterials are advantageous because the surgical procedures for implantation are minimally invasive and the solid phase can fill irregularly shaped tissue defects, eliminating the need for custom-size implants. Injectability can be achieved through a variety of mechanisms. External factors, like pH, have been investigated as a trigger for the formation of gels that encapsulate cells and bioactive molecules6-8. However, pH may not be the most convenient trigger to use in all physiological environments. Another traditional alternative for achieving injectability is using in situ chemical polymerization or crosslinking. A group developed a water-soluble redox system composed of ammonium persulfate and N,N,N',N'-tetramethylethylenediamine and used it for reacting macromers composed of polyethylene glycol and poly(propylene) glycol 9,10. Zan et al. 11 developed injectable chitosan polyvinylalcohol networks crosslinked with glutaraldehyde. In such systems, the cytotoxicity of reactive components must be considered, especially for applications involving cell encapsulation. Also, exothermic polymerization could produce high enough temperatures to compromise surrounding tissue, which has been reported for polymeric bone cements 12,13. Still other injectable polymer systems have been developed that exhibit a change from the liquid to solid state with temperature as the trigger. Known as thermogelling systems, these are aqueous polymer solutions that do not require chemical stimulus, monomers, or crosslinkers to achieve in situ formation 14. Rather, a phase transition usually occurring near physiological temperature induces the formation of a physically crosslinked three-dimensional network. Poloxamers such as Pluronic F127 are among the most widely studied polymers for thermogelling drug delivery 15-17 and cell encapsulation 18,19. However, it is well accepted that these gels lack stability at physiological conditions. Studies have demonstrated increased stability using chain extenders 20 or chemical crosslinkers 21,22. Nevertheless, the use of these reagents may limit the potential of the materials for cell encapsulation. Poly(N-isopropylacrylamide) is a synthetic thermogelling polymer that has received significant attention in tissue engineering and drug delivery 14. Aqueous solutions of poly(N-isopropylacrylamide) (PNIPAAm) exhibit a lower critical solution temperature (LCST), typically occurring around 32 - 34 °C 23,24. Below the LCST, water hydrates PNIPAAm chains. Above the transition temperature, the polymer becomes hydrophobic, resulting in a dramatic phase separation 25-27 and formation of a solid gel without the use of toxic monomers or crosslinkers. However, PNIPAAm homopolymers exhibit poor elastic properties and hold little water at physiological temperature due to hydrophobicity 28. In this work, we choose to incorporate chondroitin sulfate covalently into the PNIPAAm network, which offers the potential for enzymatic degradability 29, anti-inflammatory activity 30,31, and increased water and nutrient absorption 32. PNIPAAm copolymers with CS were prepared in our laboratory by polymerizing the monomer NIPAAm in the presence of methacrylate-functionalized CS to form grafted copolymer (PNIPAAm-g-CS). Because of the low crosslinking density of the copolymer, PNIPAAm-g-CS forms a viscous solution in water at RT and an elastic gel at physiological temperature due to the LCST 29. The polymer solutions become flowable again upon cooling below the LCST due to the reversibility of the transition. We have demonstrated that PNIPAAm-g-CS has the potential to function as a tissue engineering scaffold, due to mechanical properties that can be tailored, degradability, and cytocompatibility with human embryonic kidney (HEK) 293 cells 29. However, in certain load bearing areas, such as the intervertebral disc, tissue engineering scaffolds should have the ability to form a substantial interface with surrounding disc tissue to eliminate the risk of dislocation 33. This interface is also necessary for the adequate transmission of force across the interface between the implant and the tissue 33. In our work, we have suspended alginate microparticles in aqueous solutions of PNIPAAm-g-CS and found that gelation localizes the microparticles, which provide adhesion with surrounding tissue 34. In this paper, we outline the steps for preparation of the thermogelling, adhesive polymer. Standard techniques for biomaterials characterization, cell imaging, and assays for viability were adapted to take into account the temperature sensitivity of the polymer and the reversibility of the phase transition. The injectable polymer described in this paper has wide potential for drug delivery and tissue engineering applications outside of those described in this paper. Moreover, the characterization methods described here may be applicable to other thermogelling systems. Prior to the synthesis of the bioadhesive hydrogel, purify N-isopropylacrylamide (NIPAAm) monomer and methacrylate chondroitin sulfate (CS). Weigh out at least 10 g of NIPAAm and dissolve the monomer in 400 ml of n-hexane at 60 °C. Stir the container periodically until complete dissolution. Recrystallize the solution in a -20 °C freezer for 24 hr. Remove the crystallized monomer from the container and vacuum filter the n-hexane using a Buchner funnel. Place the monomer in a vacuum oven at RT for 24 hr to remove any remaining n-hexane. Store the monomer in a -20 °C freezer for later use (see step 1.2). Weigh out and dissolve 2.0 g of chondroitin sulfate in 8.0 ml of deionized water. Gently heat the solution to 60 °C. Adjust the pH of the solution to 10 using approximately 10 to 40 µl of 50% (w/w) NaOH. Add 0.298 ml of methacrylic anhydride (MA). Reflux for 24 hr, while stirring at 60 °C. Pour 400 ml of acetone solution into a jar and chill O/N in a -20 °C freezer. After 24 hr have elapsed, slowly pour the entire methacrylated CS (mCS) solution into 400 ml of cold acetone, while stirring with a magnetic stir bar. Remove the mCS from the acetone and place the precipitate into a vacuum oven. Perform this step quickly to maintain an intact and cohesive state for mCS. Allow the residual acetone to evaporate under vacuum for at least 24 hr. Co-dissolve 10 g of purified NIPAAm and 2.209 g of mCS in 232 ml of deionized water. Purge the solution of oxygen by using inert nitrogen gas. Maintain a vigorous, yet low gas flow rate to prevent the solution from bubbling over for 15 min. Continue purging the solution with nitrogen gas and add 0.976 ml of tetramethylethylenediamine (TEMED). Next, initiate the polymerization reaction by mixing 97.6 mg of ammonium persulfate (APS). Mix the solution for approximately 20 sec and quickly seal the solution to prevent any air from entering the vessel. Allow the solution to polymerize under fluorescent light for 24 hr. After 24 hr, place the reaction vessel into a 37 °C oven. Allow the hydrogel to transition from a liquid to a gel-like state. Submerge the polymerized hydrogel in 1X phosphate-buffered saline (PBS) for a total of 7 days to allow for diffusion of unreacted monomer out of the hydrogel. Using a pair of scissors, cut the hydrogel into several small pieces, no greater than 5 cm in diameter. To prevent the hydrogel from transitioning from a gel-like state to a liquid, dice the polymer within the 37 °C PBS solution. Transfer the portions into 50 ml conical tubes. Prepare the samples for lyophilization by wrapping the tops of the tubes with Kimwipes and rubber bands. Freeze the tubes at -70 °C for 1 to 2 hr. Place the conical tubes on the freeze dryer to remove all of the water from the hydrogel. Before operating, the freeze dryer needs to reach a temperature and pressure of approximately -40 °C and 0.04 mbar, respectively. A minimum of 7 days is required for complete drying. Grind the freeze dried polymer into a fine powder and store in a 4 °C refrigerator for later use (see step 3.1). Prepare a 2% (w/v) alginate solution by dissolving 400 mg in 20 ml of deionized water. Heat the solution to approximately 60 °C to facilitate dissolution. Prepare a 2% (w/v) calcium chloride solution by adding 400 mg to 20 ml of deionized water. Create an oil in water mixture by combining 100 ml of canola oil, 1.0 ml of Tween 20, and 20 ml of 2% (w/v) alginate. Emulsify the mixture for 10 min with a homogenizer at 15,000 rpm. Additionally, mix with a magnetic stir bar at 200 rpm or 2,000 rpm to create large or small microparticles, respectively. Aspirate the 2% (w/v) calcium chloride solution using a syringe with an 18 G needle tip. Slowly add the calcium chloride drop-wise into the emulsion. Once the 20 ml of calcium chloride have been exhausted, allow the microparticles within the emulsion to crosslink for 10 min. Evenly distribute the batch of microparticles into capped 50 ml conical tubes and centrifuge to a force of 1,400 x g for 2 min to remove the initial layer of canola oil. Consecutively wash, vortex, and centrifuge the microparticles with isopropanol a total of three times at 1,400 g for 2 min to remove any residual canola oil. Discard the isopropanol supernatant after each centrifugation step and wash with fresh isopropanol. Once the oil has been removed, repeat the washing procedure three additional times with deionized water to remove any residual isopropanol. Discard the deionized water supernatant after each centrifugation step and wash with fresh deionized water. Remove approximately 100 mg of wet microparticles and store in a vial. The wet microparticles will be used to measure the average diameter of the batch by light microscopy. Using light microscopy, disperse a small sample of wet microparticles in deionized water on a microscope slide. Depending on the size of the microparticles, use a 10X or 20X objective, and adjust the numerical aperture until the particles come into focus. Ensure that the microscope is calibrated for the correct objective and adjust the brightness of the light source as needed. Use a line tool to measure the longest diameter of 50 random alginate microparticles and obtain an average size for the batch. Prepare the microparticles for lyophilization by wrapping them with Kimwipes and securing them with rubber bands. Freeze the microparticles at -70 °C for 1 hr. Place the microparticles on the lyophilizer and allow the sample to dry for at least 24 hr. Grind the freeze dried microparticles into a fine powder using a mortar and pestle and store in a 4 °C refrigerator for later use (see step 3.3). Using the freeze-dried polymer powder, create a 5% (w/v) PNIPAAm-g-CS solution by dissolving 50 mg of hydrogel powder in 1 ml of 1x PBS. Mix the solution using a vortex and chill in a refrigerator at 4 °C for 24 hr. Once the viscous solution forms, create a homogenous composite by adding 25 or 50 mg of freeze dried alginate microparticles to the hydrogel solution and vortex. Store the composite in a refrigerator at 4 °C for later use (see steps 4.3 and 4.8). Prior to performing tensile tests, extract cartilage substrate from a porcine ear. Defrost a porcine ear in a warm 0.9% (w/v) NaCl solution; this will help to loosen the tissue. Using a scalpel, isolate and section off a flat, rectangular area by cutting vertically though the epidermal layer, subcutaneous tissue, and cartilage. Avoid cutting the curved ridges of the porcine ear. Separate the epidermal layer of skin from the cartilage by cutting parallel through the subcutaneous tissue. The cartilage is a hard, white tissue found beneath the porcine skin. Carefully scrape the subcutaneous tissue that is attached to the cartilage with the side of the scalpel. Avoid cutting into the cartilage tissue with the scalpel blade. Ensure that only one side of the cartilage is exposed and flat during tensile testing. If necessary, flatten the cartilage by cutting off the uneven skin on the underside. Cut the cartilage tissue into several pieces with dimensions of 1 cm x 1 cm. Store the cartilage tissue in conical tubes filled with 0.9% (w/v) NaCl solution in a -20 °C freezer. Prepare 2.0 L of 0.9% (w/v) NaCl solution. Pre-heat the saline solution to 37 °C. The temperature of this solution will need to be maintained throughout testing. Defrost the frozen cartilage. Keep both the porcine cartilage and the hydrogel samples in a Styrofoam container with ice packs. Attach the force gauge to the arm of the test stand. Place a hotplate on top of the force stand and set the temperature to 50 °C. Affix a 1 cm x 1 cm piece of cartilage to the stainless steel block with cyanoacrylate glue and a pair of tweezers. Glue an additional piece of cartilage to the Delrin cylinder and attach the cylinder to the force gauge. It is very important that both cartilage surfaces face each other and contact the hydrogel. Place the Plexiglas water bath on top of the hot plate and insert the stainless steel block with the cartilage substrate inside the bath. Lower the arm of the test stand and align both cartilage substrates with one another. Raise the arm and leave enough room to apply the hydrogel. With a positive displacement pipette, dispense 200 µl of the bioadhesive hydrogel to the bottom piece of cartilage. Lower the arm of the force stand at 1 mm/min until the hydrogel contacts the upper piece of cartilage and exerts a preload force of 0.001 N.
Pour the 37 °C saline solution into the bath until the volume reaches the designated water level. Check the temperature of the solution with a thermocouple. Allow the hydrogel to set for a total of 5 minutes. Once the gel has solidified, raise the arm at a speed of 2 mm/min. The test is completed once the bioadhesive detaches from the cartilage substrate or when a significant drop in force occurs, signaling failure. Collect the recorded data and raise the arm of the test stand. Remove the Delrin cylinder from the force gauge. Pour the saline solution into its previous container and reheat to 37 °C. Calculate stresses by subtracting the force exerted by the polymer from the buoyant force of a "blank", the Delrin attachment with no cartilage or adhesive, raised at the same rate, and dividing by the bond area. Prepare clean glass vials and label them appropriately with a time point, sample type, and sample number. The adhesives may also be created, as previously described. Prepare a total of five samples (n = 5) for each sample type per time point. Pre-weigh all glass vials and record their initial mass at RT. Using a syringe, dispense approximately 0.4 ml of the prepared adhesive sample into each of the five vials. Repeat this step for each sample type across all tested time points. Weigh and record the mass of each vial with the adhesive sample type at RT. Pre-warm an orbital incubator and 1 L of 1x PBS solution to 37 °C. Organize all of the vials on a rack and insert the rack into the incubator. Allow the adhesives to transition from a liquid to a gel for approximately 5 to 10 min. Add 5.0 ml of 1x PBS to each vial. Be sure to carefully add the PBS solution along the side of the vial to prevent the hydrogel disc from breaking apart. Cap each vial to prevent evaporation of the PBS solution and maintain the internal temperature of the incubator at 37 °C. Each set of hydrogel discs will need to remain submerged in PBS for a designated length of time. Once a 7 day time point has been reached, uncap the set of vials and remove the PBS solution from each vial. Weigh each vial with the adhesive sample again at RT. Before performing the Live/Dead assay with PNIPAAm-g-CS, grow human embryonic kidney 293 cells (HEK-293) to 80% confluence. Quick-thaw the frozen HEK-293 cell suspension by placing the cryovial in a 37 °C water bath, then centrifuge the cells at 400 x g at 4 °C for 5 min in a 15 ml conical tube. To make the first passage cell growth medium, combine in high glucose (4.5 g/L) Dulbecco's Modified Eagle's Medium (DMEM) with heat inactivated fetal bovine serum (FBS) to a final concentration of 20% and the 100x penicillin-streptomycin solution (pen-strep) to a final concentration of 100 I.U/ml penicillin and 100 μg/ml streptomycin. For all other passages, switch to DMEM with 10% FBS and 1x pen-strep. Resuspend the cell pellet in 10 ml of growth medium and transfer the suspension into one 100 mm diameter petri dish. Evenly distribute the cells by gently tilting the dish front to back and left to right a few times each direction. Culture the cells in a humidified incubator at 37 °C with 5% CO2. If necessary, change the medium every two days. When cells reach 80% confluency, replicate the culture into multiple dishes. Remove the medium from the plate. Add 1 ml of 0.5% trypsin to the plate. Allow the plates to incubate at 37 °C for 10 min. Check to see if the cells detach from the surface by gently swirling the plate. For splitting the culture 1:10, add 9 ml of regular growth medium (DMEM with 10% FBS) to the trypsinized cells and gently mix by tilting the dish. Dispense 1 ml of the diluted cell suspension into each new dish and add 9 ml of growth medium. Gently mix by tilting the dish. Culture the cells in a humidified incubator at 37 °C with 5% CO2. If necessary, change the medium every two days until cells reach 80% confluence. Remove the media from two culture dishes grown to 80% confluence. Add 1 ml of 0.5% trypsin to each plate. Allow the plates to incubate at 37 °C for 10 min. Check to see if the cells detach from the surface by gently swirling the plate. Wash the HEK-293 cells on the plate with 3 ml of growth medium twice and add both suspensions to the same 15 ml conical tube. Centrifuge the 15 ml conical tube for 10 min at 400 x g at 4 °C. Remove the supernatant and resuspend the cell pellet in 3 ml of medium by pipetting up and down. Pipette 10 µl of the cell suspension into a hemocytometer and perform a cell count to determine the cell density. Increase the suspension volume of medium if the initial cell concentration is too high, and conversely decrease the volume if the concentration is too low, in order to preserve a target concentration of 1 x 106 cells/ml. Centrifuge the HEK-293 cells at 400 x g and resuspend the cell pellet in the corrected volume of media accordingly. Gently vortex the cell suspension and evenly distribute the cell mix into four separate 15 ml conical tubes for the following test conditions: positive control monolayer, negative killed control in PNIPAAm-g-CS using 70% (v/v) methanol, HEK-293 cells encapsulated in PNIPAAm-g-CS, and HEK-293 cells encapsulated in PNIPAAm-g-CS with alginate microparticles. Create positive control monolayers by pipetting multiple 300 µl volumes of the cell mix into a 24-well plate to generate 4-6 replicate samples. Remove the media from the conical tubes pertaining to the killed control, PNIPAAm-g-CS, and PNIPAAm-g-CS with alginate microparticles. Centrifuge the conical tubes for 5 minutes at 400 x g and remove the supernatant. Maintain the same cell concentration by resuspending the cells in the same volume of PNIPAAm-g-CS as the removed media. Pipette the polymer cell mix up and down using a serological pipette until homogenous. If seeding with alginate microparticles, transfer the PNIPAAm-g-CS-cell suspension (obtained as described for 6.10.2) into a 35 mm culture dish and introduce the particles into the mix. Pipette the cell mix up and down using a serological pipette until homogenous. Using the serological pipette, dispense multiple 300 µl of the polymer cell mix into each of the wells for killed control, PNIPAAm-g-CS, and PNIPAAm-g-CS with alginate microparticles to generate 4 - 6 replicate samples. Incubate the plate at 37 °C for 10 to 15 min and allow the PNIPAAm-g-CS to transition from a liquid to a gel (the polymer forms an opaque, white disc). Position a slide warmer in the hood and set the temperature to 37 °C. Use the slide warmer to maintain well plate temperature and pipette 600 µl of pre-warmed media into each well. To further prevent the transitioning of the polymer to a liquid state, position a lamp with a fluorescent bulb above the dish to warm up the air above it. Incubate the cells for 5 days at 37 °C with 5% CO2. After five days have elapsed, prepare the Live/Dead dye mix using ethidium homodimer (EthD-1) and calcein AM. Both substances are light sensitive and prepared on the day of use. Defrost the calcein AM and EthD-1 from the kit at RT. Add 5 ml of sterile 1x PBS to a conical tube and wrap it in aluminum foil. Add 6.67 µl of 2 mM EthD-1 to the conical tube. Vortex the solution mixture thoroughly. Next, add 2.5 µl of 4 mM calcein AM to the conical tube. Vortex the mixture thoroughly. Remove the media from the wells of the monolayer (positive control), PNIPAAm-g-CS, and PNIPAAm-g-CS with alginate microparticles. Wash all of the wells thoroughly, but gently, with PBS and remove the PBS. Allow the hydrogel discs containing alginate microparticles to liquefy at RT and add 2 ml of 50 mM sodium citrate to each of the wells. Remove the media from the killed cell wells (negative control). Allow the hydrogel discs to liquefy at RT and add 300 µl of 70% (v/v) methanol to each well. Incubate the plate for 45 min at 37 °C. Remove the sodium citrate and methanol solutions from the wells and pipette each of the hydrogel suspensions into individual microcentrifuge tubes. Centrifuge the tubes at 2,000 x g for 10 min to separate the cells from the hydrogel suspension. Carefully remove the suspension by pipetting the solution from the conical tube and leaving behind the cell pellet. Resuspend the pellet in 300 µl of PBS and transfer to the original well plate. Add 300 µl of the Live/Dead dye mix to each of the wells. Wrap the well plate in aluminum foil and incubate for 45 min on a rocker at RT. Image all of the samples under an inverted fluorescence microscope with a 10X objective. Living cells and killed cells will display a green and red fluorescence, respectively. Grow HEK-293 cells to 80% confluence. Remove the growth media from two culture dishes. Wash the HEK-293 cells on the plate with 3 ml of media twice and add both suspensions to the same 15 ml conical tube. Remove the supernatant and resuspend the cell pellet in 3 ml of media by pipetting up and down. Pipette 10 µl of the cell suspension into a hemocytometer and perform a cell count to determine the cell density. As previously described, preserve a target concentration of 1 x 106 cells/ml. Centrifuge the HEK-293 cells at 400 x g and resuspend the cell pellet in the corrected volume of media accordingly. Create positive control monolayers by pipetting 300 µl of the cell mix into a 24-well plate to generate 4 - 6 replicate samples. Centrifuge the conical tubes for 5 min at 400 x g and remove the supernatant. Maintain the same cell concentration by resuspending the cells in the same volume of PNIPAAm-g-CS as the removed media. Pipette the cell mix up and down using a serological pipette until homogenous. If seeding with alginate microparticles, transfer the PNIPAAm-g-CS-cell suspension into a 35 mm culture dish and introduce the particles into the mix. Pipette the cell mix up and down using a serological pipette until homogenous. Using the serological pipette, dispense 300 µl of the polymer cell mix into each of the wells for killed control, PNIPAAm-g-CS, and PNIPAAm-g-CS with alginate microparticles to generate 4 - 6 replicate samples. Once all of the cell-containing samples have been added to the 24-well plate, dispense multiple 300 µl volumes of PNIPAAm-g-CS and PNIPAAm-g-CS with alginate microparticles without cells in adjacent wells to generate 4 - 6 replicate samples. Incubate the 24-well plate at 37 °C for 10 to 15 min and allow the PNIPAAm-g-CS to transition from a liquid to a gel (the polymer forms an opaque, white disc). Position a slide warmer in the hood and set the temperature to 37 °C. Use the slide warmer to maintain well plate temperature and pipette 600 µl of pre-warmed clear DMEM into each well. To further prevent the transitioning of the polymer to a liquid state, position a lamp with a fluorescent bulb above the dish to warm up the air above it. Incubate the cells for 5 days at 37 °C at 5% CO2. After five days have elapsed, prepare the 2,3-bis-(2-methoxy-4-nitro-5-sulfophenyl)-2H-tetrazolium-5-carboxanilide (XTT) reagent from the manufacturer. The XTT reagent is light sensitive and prepared on the day of use. Remove the amber bottle containing the XTT powder from the refrigerator. Using a sterile syringe and needle, inject 5 ml of clear DMEM (no phenol red) through the rubber septum into the amber bottle. Heat the reagent to 56 °C in a water bath for 10 min or until dissolved. Further dilute the XTT reagent to 20% (v/v) in a 15 ml conical tube wrapped in aluminum foil. Aliquot the excess XTT reagent in microcentrifuge tubes and place them in the -20 °C freezer for long term storage. Remove the media from the killed cell wells (negative control) and add 300 µl of 70% (v/v) methanol to each well. Incubate for 45 min at 37 °C and remove the methanol from the wells. Remove the media from the remaining wells of the monolayer (positive control), PNIPAAm-g-CS, and PNIPAAm-g-CS with alginate microparticles. Wash all of the wells thoroughly, but gently, with PBS and then remove the PBS. Add 300 µl of the 20% XTT reagent to each of the wells. Wrap the 24-well plate in aluminum foil and incubate for 24 hr on a rocker at RT. After 24 hr, add 200 µl of 50 mM sodium citrate to all of the wells and incubate on the rocker for one additional hr. Transfer all of the polymer suspensions to microcentrifuge tubes and centrifuge at 2,000 x g for 10 min at RT. Transfer 200 µl of the supernatant from each microcentrifuge tube to a 96-well plate. Using a microtiter plate reader, obtain specific absorbance readings at 450 nm and non-specific absorbance readings at 690 nm. A thermally responsive grafted co-polymer was successfully synthesized and characterized for its bioadhesive strength, swelling properties, and in vitro cytocompatibility. We chose to investigate alginate due to its well-established mucoadhesive properties. 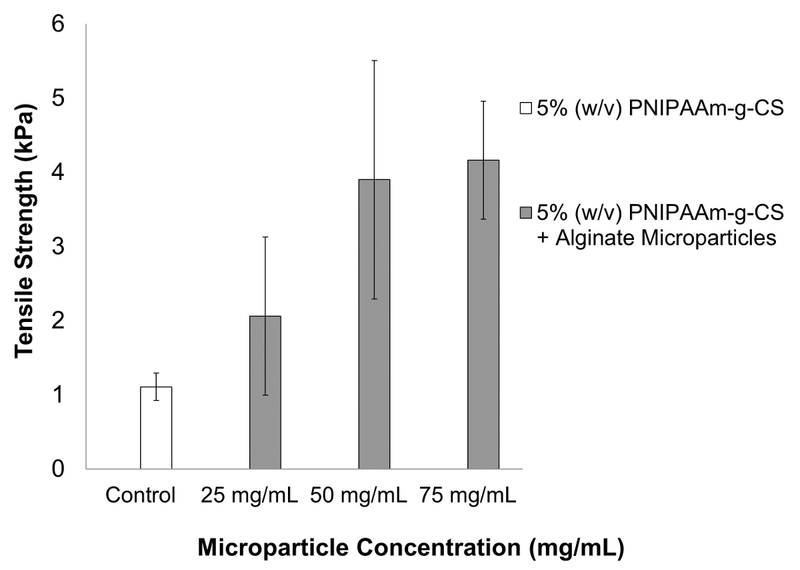 Alginate microparticles, with an average diameter of 59.7 ± 14.9 µm, were blended with 5% (w/v) PNIPAAm-g-CS at concentrations of 25, 50, and 75 mg/ml. These concentrations were based on one-half, equal to, and twice the equivalent dry weight of PNIPAAm-g-CS in aqueous solution. Microparticle concentrations above 75 mg/ml exhibited excessive viscosity and were not investigated. The maximum tensile adhesive strength of 5% (w/v) PNIPAAm-g-CS with varying concentrations of alginate microparticles were compared to the hydrogel alone. The addition of 50 or 75 mg/ml of alginate microparticles suspended in 5% (w/v) PNIPAAm-g-CS resulted in a four-fold increase in tensile strength (p<0.05), as shown in Figure 1. A microparticle concentration of 25 mg/ml did not show a significant increase in tensile strength compared to 5% (w/v) PNIPAAm-g-CS (p>0.05). There was no significant change in the tensile strength of 5% (w/v) PNIPAAm-g-CS when the concentration of alginate microparticles was increased from 50 to 75 mg/ml (p>0.05). The swelling properties of the bioadhesive hydrogel were characterized by immersing various formulations in PBS at 37 °C. Alginate microparticle concentrations of 25 and 50 mg/ml were tested to identify any differences in swelling behavior. Alginate microparticles were measured using light microscopy and had an average diameter of 25.0 ± 14.4 µm. After 7 days, the initial and final wet mass of the hydrogel discs were recorded and a change in mass was calculated for multiple samples per adhesive formulation (n = 5). Figure 2 shows a drastic difference in the change in mass amongst all formulations. 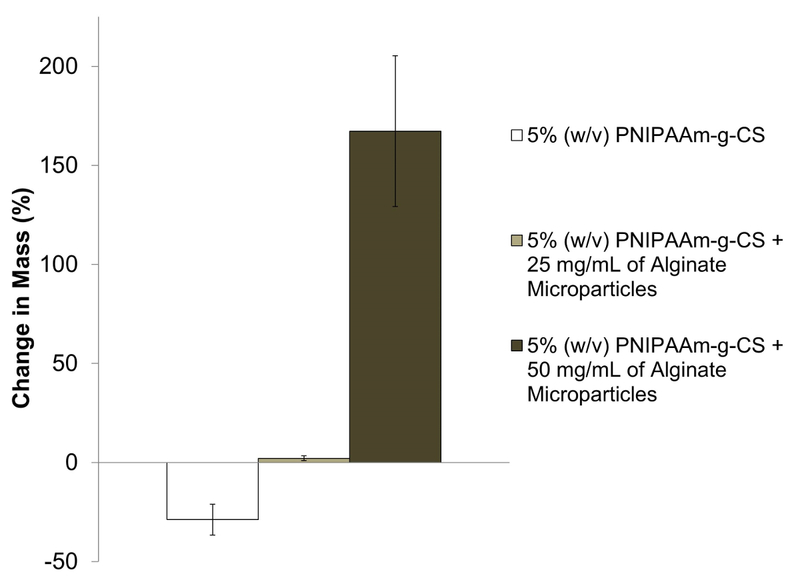 Adhesives containing both 25 and 50 mg/ml of alginate microparticles demonstrated positive changes in mass, while 5% (w/v) PNIPAAm-g-CS decreased in mass. All samples were found to be significantly different from one another (p<0.05) with the adhesive containing 50 mg/ml of alginate microparticles showing the greatest swelling effect. The biocompatibility of the proposed adhesive was investigated both qualitatively and quantitatively through the use of a Live/Dead and XTT cytotoxicity assay. HEK-293 cells were encapsulated in both 5% (w/v) PNIPAAm-g-CS and 5% (w/v) PNIPAAm-g-CS containing 50 mg/ml of alginate microparticles with an average diameter of 59.7 ± 14.9 µm. A monolayer of cells and encapsulated cells in PNIPAAm-g-CS killed with 70% methanol were considered the positive and negative controls, respectively. Formulations seeded with cells were characterized after 5 days of growth in a humidified incubator at 37 °C with 5% CO2. Each test indicated good cell viability for both PNIPAAm-g-CS and PNIPAAm-g-CS with microparticles. Images from Figure 3 illustrate living cells fluorescing green in both adhesive formulations (Panels A and B) and the cell monolayer, serving as the positive control (Panel C). Killed cells (Panel D) fluoresce a red color and show cell death. Results from the XTT cytotoxicity tests confirmed the results of the Live/Dead assay. The relative cell viability of the adhesive containing 50 mg/ml of microparticles decreased 1.3 fold compared to PNIPAAm-g-CS as illustrated in Figure 4, but the decrease was not statistically significant (p>0.05). Both PNIPAAM-g-CS and PNIPAAM-g-CS with microparticles also had comparable viability to the cell monolayer (p>0.05). Encapsulated cells in hydrogel formulations and the cell monolayer were found to be significantly different compared to the negative control (p<0.05). Overall, these results suggest that the adhesive containing microparticles not only exhibits increased adhesive strength, but good biocompatibility as well. Figure 1. The Effects on Tensile Strength After Incorporating Varying Concentrations of Alginate Microparticles into 5% (w/v) PNIPAAm-g-CS. The tensile strength of PNIPAAm-g-CS quadrupled with the addition of 50 or 75 mg/ml of alginate microparticles (p<0.5). Error bars represent a calculated 95% confidence interval (n = 5). Alginate microparticles had an average size of 59.7 ± 14.9 µm. Please click here to view a larger version of this figure. Figure 2. The Effect of Varying Concentrations of Alginate Microparticles on the Swelling Capacity of 5% (w/v) PNIPAAm-g-CS. After 7 days immersion in 37 °C PBS, PNIPAAm-g-CS decreased in wet mass due to the hydrophobic properties of PNIPAAm above the LCST. PNIPAAm-g-CS with 25 or 50 mg/ml of alginate microparticles exhibited swelling capability. Increasing the concentration of microparticles significantly increased (p<0.05) the change in mass of the hydrogel over 7 days, attributed to water uptake. Error bars represent a calculated 95% confidence interval. Alginate microparticles had an average size of 25.0 ± 14.4 µm. Please click here to view a larger version of this figure. Figure 3. Representative Live/Dead Fluorescence Images of Cultured HEK-293 cells Over a Period of 5 Days. 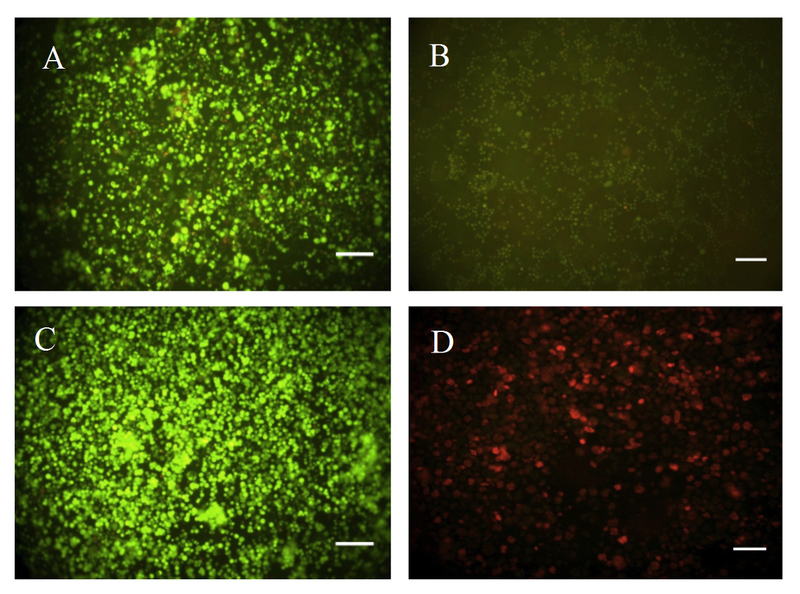 Cells were encapsulated in (A) PNIPAAm-g-CS and (B) PNIPAAm-g-CS with 50 mg/ml of alginate microparticles. Cells were also grown in a (C) monolayer and (D) killed with methanol in PNIPAAm-g-CS to represent a positive and negative control, respectively. The Live/Dead viability experiment was repeated three times with three replicates per experiment. Scale bars represent 100 µm. Alginate microparticles had an average size of 59.7 ± 14.9 µm. Please click here to view a larger version of this figure. Figure 4. Short-term Viability of HEK-293 Cells in PNIPAAm-g-CS with Alginate Microparticles. Survival of encapsulated HEK-293 cells within PNIPAAm-g-CS with and without alginate microparticles was assessed and compared using XTT after 5 days. A cell monolayer and encapsulated cells in PNIPAAm-g-CS killed with 70% methanol were used as positive and negative controls, respectively. 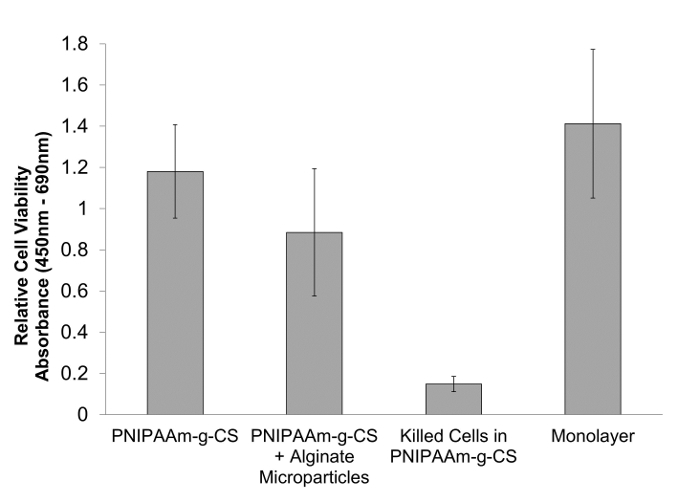 Both PNIPAAm-g-CS and PNIPAAm-g-CS with alginate microparticles showed no significant reduction (p>0.05) in cell viability compared to the cell monolayer, yet showed a significant reduction (p<0.05) in cell viability compared to the killed cells. The addition of alginate microparticles does not significantly compromise the cell viability of PNIPAAm-g-CS (p>0.05). Error bars represent a calculated 95% confidence interval (n = 3, six replicates per experiment). Alginate microparticles had an average size of 59.7 ± 14.9 µm. Please click here to view a larger version of this figure. There are several critical steps in synthesizing the hydrogel-microparticle composite and evaluating its adhesive strength, swelling ability, and cellular biocompatibility. Free radical polymerization of PNIPAAm-g-CS requires successful methacrylation of chondroitin sulfate, complete dissolution of monomer components, and oxygen-free reaction conditions. The ratio of NIPAAm monomer to methacrylated chondroitin sulfate in the reaction mixture was chosen because it has been demonstrated, in our previous work, to generate copolymers with mechanical properties similar to native intervertebral disc tissue 29. Increasing the amount of chondroitin sulfate in the hydrogel will reduce water loss during gelation and thus decrease the compressive stiffness of the gel. The selected degree of methacrylation has also been demonstrated to produce hydrogels with favorable handling properties for injectability through an 18 G needle when dissolved in aqueous solution 29. An increased degree of methacrylate substitution of the CS will increase the crosslink density of the polymer network, causing increased solution viscosity below the LCST and reducing gel swelling capability. Others have investigated different approaches in synthesizing PNIPAAm hydrogels such as atom transfer radical polymerization (ATRP) 35 or reverse addition-fragmentation chain transfer (RAFT) 36. Polymerization via ATRP has led to the development of narrow, polydisperse hydrogels with fined tuned molecular weight by altering the monomer to initiator ratio. Functional groups can be grafted in a comb-like manner using RAFT polymerization, thus impacting polymer chain entanglement and phase separation. A homogenous water-in-oil mixture is necessary in creating uniform, cross-linked alginate microparticles. An emulsion technique is simple to perform and does not require the use of hazardous chemicals, however both microparticle shape and distribution are difficult to control. Microparticle size can be altered by increasing the emulsion stir speed, thus creating smaller particles and vice-versa. In this particular study, alginate microparticle size was investigated as a potential property that may impact swelling, mechanics, or cellular viability. Light scattering may also be used as an alternative to measuring the average microparticle size. Other emulsion properties such as the surfactant type and alginate concentration will impact microparticle size and aggregate formation 37. Decreasing the alginate concentration will reduce the microparticle size, however aggregates are more likely to form. Variations in the hydrophilic and hydrophobic nature of surfactants will affect the surface tension between the oil and water phases, hence changing the droplet size within the emulsion. Alginate microparticles may alternatively be produced using a microfluidic device, which allows for uniform particle shape and narrow size distribution 38. This technique involves dispersing an alginate phase within a continuous oil phase that flows through a channel and enters a calcium chloride bath. Spray draying is another technique which produces very small microparticles 39. It is also important to note that alginate may be loaded with proteins or growth factors and can be cross-linked with other divalent ions such as zinc or barium. In this work, we characterize an adhesive system with potential applications in tissue engineering. Our tensile test specifically aims to quantify the adhesive strength of the composite when in contact with porcine cartilage. This type of substrate was selected to mimic adhesion of the hydrogel composite to the cartilage end plates of the intervertebral disc. Other tissue substrates, such as porcine skin, may be used as an alternative to quantify the strength of an adhesive 40, but the tissue type will vary depending on the intended application. Maintaining proper temperature control of the saline water bath and pre-cooling the composite before use are crucial in accurately measuring the mechanical properties. Elevated water bath temperatures above 37 °C will cause the hydrogel to rapidly shrink and stiffen, while composites that are mechanically tested below 37 °C will exhibit decreased tensile strength due to the lack of phase separation. Currently, we are developing methods to investigate the shear adhesive strength of various injectable adhesive formulations. Future work will include performing ex vivo mechanical tests with porcine IVDs to determine whether the adhesive resists extrusion through an annular defect and restores biomechanical functionality to the spinal motion segment. Above 32 °C, PNIPAAm-g-CS shrinks and expels water from the hydrogel matrix due to the LCST behavior of PNIPAAm, resulting in a decreased mass over a 7 day period in PBS (Figure 2). Conversely, addition of alginate microparticles imparts a swelling effect and the adhesive significantly increased in mass (p<0.05) at a microparticle concentration of 25 mg/m and even more so at 50 mg/ml. In this swelling study, changes in wet mass of the hydrogel are likely attributable to water exchange with the surroundings, since PNIPAAm-g-CS has been shown to be selectively degradable in the presence of enzymes 29. Many of the protocol steps developed for the swelling study were adapted based on the thermoreversibility of PNIPAAm-g-CS. Hydrogel discs must fully transition at 37 °C before adding the pre-warmed PBS solution, otherwise the gel will disperse. After swelling for one week, the PBS solution must be quickly and carefully removed from the vials before the hydrogels revert back to a liquid-like state. It should be noted that the swelling protocol described in this paper does not fully simulate the in vivo environment of the native IVD. The swelling properties of the scaffold in vivo will depend on the osmotic pressure of the surrounding tissues 41 and degradation behavior of the gel. However, in general, the increased swelling capacity with alginate microparticle incorporation is considered favorable, as it will help the injectable hydrogel to stay space-filling at physiological temperature. Characteristics such as the swelling ratio and water content may be calculated with additional dry mass measurements. Future swelling studies will include immersing hydrogel discs against a polyethylene glycol (MW = 20,000 g/mol) bath, which will apply an osmotic pressure and mimic the in vivo environment of the IVD. Aside from the mechanical and swelling properties, the adhesive must exhibit cellular biocompatibility in order to be considered as a suitable scaffold. Previous studies have demonstrated the survival of encapsulated cells in alginate 42,43 and PNIPAAm-based materials 44,45. Results from both the Live/Dead and XTT assays are consistent with these prior findings, suggesting appropriate cell viability over a period of 5 days (Figures 3 and 4). Our laboratory has also conducted preliminary investigations of viability over a longer time course (21 days) and observed similar behavior. In general, a surplus of PNIPAAm-g-CS and microparticles should be prepared to account for any material loss during pipette transfers. Once again, it is extremely critical to preserve scaffold architecture by maintaining proper temperature conditions at 37 °C. If the scaffold network reverts from a gel to a liquid-like state, cell attachment and viability may become compromised. With regards to the Live/Dead assay, sodium citrate plays an important role in the removal and deconstruction of alginate microparticles. Sodium citrate reverses the cross-linking action between calcium and alginate and causes a slurry to form 46. Additional washes with PBS to remove PNIPAAm-g-CS or alginate may be performed to enhance the quality of the pictures. During the XTT assay, polymer samples containing no cells are created within the well plates. These replicates serve as blank standards and are required to calculate an accurate absorbance value. Our preliminary viability studies are strictly based on using HEK-293 cells. In future studies, the differentiation of encapsulated adipose-derived mesenchymal stem cells (AD-MSC) into nucleus pulposus cells will be demonstrated. AD-MSC differentiation toward NP-like phenotype has been demonstrated by using dynamic compression 47 and hypoxia 48,49. Overall, the proposed adhesive demonstrates promise for tissue engineering applications in load bearing areas, such as the intervertebral disc, where success of the regeneration strategy will depend on scaffold ability to resist dislocation during motion and loading. This system is very versatile in that it could potentially be adapted to release extracellular matrix proteins or growth factors specific to the desired application. Importantly, the methods described here can be adapted to any characterization study with thermogelling polymers. The authors would like to gratefully acknowledge the assistance of Dr. Jennifer Kadlowec in the development of the adhesive tensile testing protocol. Research reported in this publication was supported by the National Institute of Arthritis and Musculoskeletal and Skin Diseases and the National Institute of Biomedical Imaging and Bioengineering of the National Institutes of Health under Award Number 1R15 AR 063920-01. The content is solely the responsibility of the authors and does not necessarily represent the official views of the National Institutes of Health. Bidarra, S. J., Barrias, C. C., Granja, P. L. Injectable alginate hydrogels for cell delivery in tissue engineering. Acta Biomater. 10, 1646-1662 (2014). Choi, J., et al. Human extracellular matrix (ECM) powders for injectable cell delivery and adipose tissue engineering. J. Control. Release. 139, 2-7 (2009). Selvam, S., Pithapuram, M. V., Victor, S. P., Muthu, J. Injectable in situ. forming xylitol-PEG-based hydrogels for cell encapsulation and delivery. Colloid Surface B. 126, 35-43 (2015). Park, K. M., Lee, S. Y., Joung, Y. K., Na, J. S., Lee, M. C., Park, K. D. Thermosensitive chitosan-pluronic hydrogel as an injectable cell delivery carrier for cartilage regeneration. Acta Biomater. 5, 1956-1965 (2009). Ren, K., He, C., Xiao, C., Li, G., Chen, X. Injectable glycopolypeptide hydrogels as biomimetic scaffolds for cartilage tissue engineering. Biomaterials. 51, 238-249 (2015). Chiu, Y. L., et al. pH-triggered injectable hydrogels prepared from aqueous N-palmitoyl chitosan: In vitro characteristics and in vivo biocompatibility. Biomaterials. 30, 4877-4888 (2009). Shim, W. S., et al. pH- and temperature-sensitive, injectable, biodegradable block copolymer hydrogels as carriers for paclitaxel. Int. J. Pharm. 331, 11-18 (2007). Singh, N. K., Insitu Lee, D. S. gelling pH- and temperature-sensitive biodegradable block copolymer hydrogels for drug delivery. J. Control. Release. 193, 214-227 (2014). Wang, B., Zhu, W., Zhang, Y., Yang, Z., Ding, J. Synthesis of a chemically-crosslinked thermo-sensitive hydrogel film and in situ of model protein drugs. React. Funct. Polym. 66, 509-518 (2006). Zhu, W., Ding, J. Synthesis and characterization of a redox-initiated, injectable, biodegradable hydrogel. J. Appl. Polym. Sci. 99, 2375-2383 (2006). Zan, J., Chen, H., Jiang, G., Lin, Y., Ding, F. Preparation and properties of crosslinked chitosan thermosensitive hydrogel for injectable drug delivery systems. J. Appl. Polym. Sci. 101, 1892-1898 (2006). Togawa, D., Bauer, T. W., Lieberman, I. H., Takikawa, S. Histologic evaluation of human vertebral bodies after vertebral augmentation with polymethyl methacrylate. Spine. 28, 1521-1527 (2003). Berman, A. T., Reid, J. S., Yanicko, D. R., Sih, G. C., Zimmerman, M. R. Thermally induced bone necrosis in rabbits: relation to implant failure in humans. Clin. Orthop. Relat. R. 186, 284-292 (1984). Kretlow, J. D., Klouda, L., Mikos, A. G. Injectable matrices and scaffolds for drug delivery in tissue engineering. Adv Drug. Deliver. Rev. 59, 263-273 (2007). Ye, F., Yaghmur, A., Jensen, H., Larsen, S. W., Larsen, C., Ostergaard, J. Real-time UV imaging of drug diffusion and release from Pluronic F127 hydrogels. Eur. J. Pharm. Sci. 43, 236-243 (2011). Akash, M. S., Rehman, K. Recent progress in biomedical applications of pluronic (PF127): Pharmaceutical perspectives. J. Control Release. 209, 120-138 (2015). Sellers, D. L., Kim, T. H., Mount, C. W., Pun, S. H., Horner, P. J. Poly(lactic-co-glycolic) acid microspheres encapsulated in Pluronic F-127 prolong hirudin delivery and improve functional recovery from a demyelination lesion. Biomaterials. 35, 8895-8902 (2014). Jung, H., Park, K., Han, D. K. Preparation of TGF-β1-conjugated biodegradable pluronic F127 hydrogel and its application with adipose-derived stem cells. J. Control. Release. 147, 84-91 (2010). Lee, S. Y., Tae, G. Formulation and in vitro of an in situ photo-polymerizable pluronic hydrogel suitable for injection. J. Control. Release. 119, 313-319 (2007). Chen, Y. Y., Wu, H. C., Sun, J. S., Dong, G. C., Wang, T. W. Injectable and thermoresponsive self-assembled nanocomposite hydrogel for long-term anticancer drug delivery. Langmuir. 19, 3721-3729 (2013). Cellesi, F., Tirelli, N., Hubbell, J. A. Materials for cell encapsulation via a new tandem approach combining reverse thermal gelation and covalent crosslinking. Macromol. Chem. Physic. 203, 1466-1472 (2002). Cellesi, F., Tirelli, N., Hubbell, J. A. Towards a fully-synthetic substitute of alginate: development of a new process using thermal gelation and chemical cross-linking. Biomaterials. 25, 5115-5124 (2004). Hirokawa, Y., Tanaka, T. Volume phase transition in a nonionic gel. J. Chem. Phys. 81, 6379-6380 (1984). Freitas, R., Cussler, E. L. Temperature sensitive gels as extraction solvents. Chem. Eng. Sci. 42, 97-103 (1987). Schild, H., Tirrel, D. A. Microcalorimetric detection of lower critical solution temperatures in aqueous polymer solutions. J. Chem. Phys. 94, 4352-4356 (1990). Yagi, Y., Inomata, H., Saito, S. Solubility parameter of an N-isopropylacrylamide gel. Macromol. 25, 2997-2998 (1992). Illmain, F., Tanaka, T., Kokufuta, E. Volume transition in a gel driven by hydrogen bonding. Nature. 349, 400-401 (1990). Vernengo, J., Fussell, G. W., Smith, N. G., Lowman, A. M. Evaluation of novel injectable hydrogels for nucleus pulposus replacement. J. Biomed. Mater. Res. B. 84, 64-69 (2008). Wiltsey, C., et al. Characterization of injectable hydrogels based on poly(N-isopropylacrylamide)-g-chondroitin sulfate with adhesive properties for nucleus pulposus tissue engineering. J. Mater. Sci-Mater. M. 24, 837-847 (2013). Ronca, F., Palmieri, L., Panicucci, P., Ronca, G. Anti-inflammatory activity of chondroitin sulfate. Osteoarthr. Cart. 6, 14-21 (1998). Pipitone, V. Chondroprotection with chondroitin sulfate. Drug. Exp. Clin. Res. 17, 3-7 (1991). Moss, M., Kruger, G. O., Reynolds, D. C. The effect of chondroitin sulfate on bone healing. Oral Surg. Oral Med. O. 20, 795-801 (1965). Nerurkar, N., Elliott, D. M., Mauck, R. L. Mechanical design criteria fo intervertebral disc tissue engineering. J. Biomech. 43, 1017-1030 (2010). Wiltsey, C., et al. Thermogelling bioadhesive scaffolds for intervertebral disk tissue engineering: Preliminary in vitro of aldehyde-based versus alginate microparticle-mediated adhesion. Acta Biomater. 16, 71-80 (2015). Xia, Y., Yin, X., Burke, N., Stover, H. Thermal response of narrow-disperse poly(N-isopropylacrylamide) prepared by atom transfer radical polymerization. Macromol. 38, 5937-5943 (2005). Liu, Q., Zhang, P., Qing, A., Lan, Y., Lu, M. Poly(N-isopropylacrylamide) hydrogels with improved shrinking kinetics by RAFT polymerization. Polymer. 47, 2330-2336 (2006). Lemoine, D., Wauters, F., Bouchend'homme, S., Preat, V. Preparation and characterization of alginate microspheres containing a model antigen. Int. J. Pharm. 176, 9-19 (1998). Dang, T. D., Joo, S. W. Preparation of tadpole-shaped calcium alginate microparticles with sphericity control. Colloid. Surface. B. 102, 766-771 (2013). Moebus, K., Siepmann, J., Bodmeier, R. Novel preparation techniques for alginate-polaxamer microparticles controlling protein release on mucosal surfaces. Eur. J. Pharm. Sci. 45, 358-366 (2012). Lih, E., Lee, J. S., Park, K. M., Park,, D, K. Rapidly curable chitosan-PEG hydrogels as tissue adhesives for hemostasis and wound healing. Acta Biomater. 8, 3261-3269 (2012). Urban, J., Maroudas, A. Swelling of the intervertebral disc in vitro. Connect. Tissue Res. 9, 1-10 (1981). Ma, H. L., Hung, S. C., Lin, S. Y., Chen, Y. L., Lo, W. H. Chondrogenesis of human mesenchymal stem cells encapsulated in alginate beads. J. Biomed. Mater. Res. A. 64, 273-281 (2003). Leslie, S. K., et al. Controlled release of rat adipose-derived stem cells from alginate microbeads. Biomaterials. 34, 8172-8184 (2013). Peroglio, M., Eglin, D., Benneker, L. M., Alini, M., Grad, S. Thermoreversible hyaluronan-based hydrogel supports in vitro. and ex vivo. disc-like differentiation of human mesenchymal stem cells. Spine J. 13, 1627-1639 (2013). Chen, J. P., Cheng, T. H. Thermo-responsive chitosan-graft-poly(N-isopropylacrylamide) injectable hydrogel for cultivation of chondrocytes and meniscus cells. Macromol. Biosci. 6, 1026-1039 (2006). Schoichet, M. S., Li, R. H., White, M. L., Winn, S. R. Stability of hydrogels used in cell encapsulation: an in vitro comparison of alginate and agarose. Biotechnol. Bioeng. 50, 374-381 (1996). Dai, J., Wang, H., Liu, G., Xu, Z., Li, F., Fang, H. Dynamic compression and co-culture with nucleus pulposus cells promotes proliferation and differentiation of adipose-derived mesenchymal stem cells. J. Biomech. 47, 966-972 (2014). Feng, G., et al. Effects of hypoxias and scaffold architecture on rabbit mesenchymal stem cell differentiation towards a nucleus pulposus-like phenotype. Biomaterials. 32, 8182-8189 (2011). Feng, G., et al. Hypoxia differentially regulates human nucleus pulposus and annulus fibrosus cell extracellular matrix production in 3D scaffolds. Osteoarth. Cartilage. 21, 582-588 (2013).